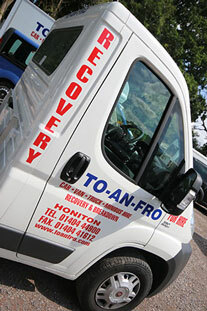 East Devon vehicle rentals specialist, To An Fro are based in Honiton but offer their vehicle hire services throughout the surrounding Devon area. You may encounter several reasons to hire a car transporting lorry like our beavertail. For the car enthusiast, you may have a new project to get from where you have bought it, to your home. A problem if it isn't a runner. This is far more efficient that trying to use a trailer, which would limit you to 50mph even on the motorway.